remember how good you actually have it. who for him, this was a bitter reality. support that will fill that hole. them to feel the joy of being parents. affected by the details of what those two twisted boys did to him. Stay safe everyone and love each other. 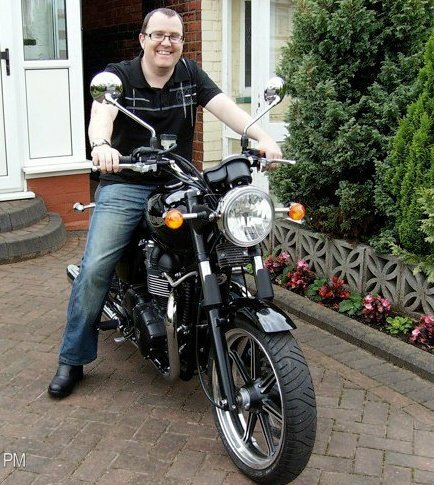 Any of my long term readers will know that I ride a motorbike. It is a particularly fine motorcycle that I had wanted for many years (having ridden bikes when I was a lot younger and given them up for the car). When I didn’t have the bike I longed to have one and when I had it, I was up until recently what you would describe as a ‘fair weather biker’: that is, I had the choice of car and bike and if it was wet or extremely cold, I would opt for the car. Since Theo was born, my wife Willy and I share the family car, and so there are days when I have to go on the bike regardless of the weather, or how I am feeling that day. This has not been a problem, and I now class myself as a proper, all-weather biker. Most non-bikers will always insist on telling you how dangerous riding bikes is, despite them only knowing about such things through the news when a biker is killed in an accident. I usually dismiss these people, and consider the facts of my own riding history: I had what could have been a fatal accident when I was 18, but escaped totally unscathed, despite flying over the bonnet of a Ford Granada and sliding 20 metres down the road, only wearing jeans and a thin jacket; I had a number of near misses due to careless car drivers but used my skill to avoid any impact; I skidded on ice once on a roundabout, but only had minor bruising. Since owning my Bonneville 3 and a half years ago I am happy to say I have had no problems, apart from careless car drivers and pedestrians who do not look what is going on around them (but they will always be around). Last week I had my first extremely minor incident on my Triumph. An incident that to most would seem trifling but was one that made me think about where I am now in my life, and how my responsibility for my own safety directly impacts those around me. Without going into detail, the incident involved me braking hard at about 10 mph, locking the front wheel that skidded on the wet concrete and left me thudding to the floor with the bike on its side next to me. Initially I knew that I was ok because my body had not flooded with pain. I picked myself and as before, worried more about the bike than me. It was ok, so I started it up, checked that there were no major problems and drove home: shaken up, but ok. When I got home and took off my protective gear I felt the dull pain of bruised ribs. This has continued over the last 7 days and serves as a constant reminder than when a 14 and a half stone man hits the floor, it will hurt somewhere, and it will hurt like hell. I am lucky that I didn’t fall awkwardly and break anything, or fall into the path of something bigger and heavier. It is at this point that I evaluate the risk of being badly injured or killed against the joy the bike gives me: I weigh up my joy against leaving my wife and child fatherless. It is a no-brainer really: the risk is not worth it.